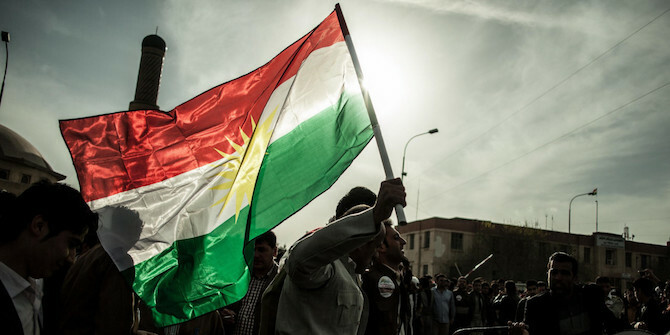 Kurdish flag flies at a protest in the Kurdistan Region of Iraq. Credit Mustafa Khayat, 2013. The independence referendum held in the Kurdistan Region of Iraq in September 2017 took the long-term tension and crisis between Erbil and Baghdad to a new level and it showed once again that the Kurdish path to independence passes through Baghdad. The history of the relationship between these rival political actors has followed a simple pattern: when Baghdad feels weak, it follows a permissive policy which renders relations relatively calm, but when Baghdad feels strong, it imposes control, which increases tension. The post-referendum process has been a period of Baghdad feeling relatively strong, with the defeat of ISIS and the relative stability in Baghdad sustained during Abadi’s rule. In this period, the interactions between Baghdad and Erbil have been tense, and even included armed clashes in the areas around Kirkuk. The period between 2014 and 2016, however, was a difficult time for Baghdad, during which Erbil was able to expand its territory and even take control of Kirkuk under the conditions created by the war against ISIS. The referendum came with huge costs for the Kurdish political elite and the people in the Kurdistan Region of Iraq. The economic crisis in the Region deepened, the KRG lost control of Kirkuk and its oil, in addition to other territories it gained after 2014, and its airports were closed to international flights. The Kurds who had aspirations for independence were surprised to see how negligible international support for their goal actually is. From the KRG’s perspective, they hoped the referendum would open the way for negotiations over outstanding issues between Baghdad and Erbil – namely the disputed territories including Kirkuk, the control and sale of oil, and the federal budget share – and eventually lead to independence. However, the outcome has been far from what KRG was hoping for. The fact that Baghdad has not requested international mediation shows the Iraqi government plans to handle the crisis on its terms. These terms are likely to be in the form of demands to establish sovereign control over oil exports and borders. After a very tense period since the referendum, there have however been slightly positive developments. Baghdad has begun to pay salaries of the KRG dam employees and declared plans to pay education, security and health sector employees’ salaries after auditing the ministry payrolls. Abadi also ordered Iraqi military officials to resume talks with their Kurdish counterparts and sent a delegation to discuss international borders with KRG authorities but has imposed conditions, chief among which are transparency with regards to the amount of oil revenues and how they have been spent. One of the goals of the KRG was to start talks, and in a sense, this can be said to have been achieved. Even though the terms of these talks and negotiations may not be what the KRG hoped for, they might relieve some economic pressures on the Region. This may be a welcome outcome, considering the fact that the economic crisis is the most urgent problem the KRI is facing today. However, serious talks over the outstanding issues are unlikely to take place. The political agenda is dominated by the elections at the moment, which will probably be followed by a crisis over government formation and control. Moreover, although ISIS appears to be defeated, security is still a key concern. Therefore, the political and security context is not conducive to solving long-term issues, at least from Baghdad’s perspective. First, although the circumstances in which the decision to hold a referendum was taken were problematic – the parliament was suspended, President Barzani had overstayed his term and not all political parties supported the referendum – the KRG is unlikely to cancel the referendum results, as has been requested by Baghdad. In some ways, the referendum achieved what it sought; Baghdad, the regional powers and the world saw clearly that the desire for independence is high among Iraqi Kurds despite differences of opinion on when and how independence should happen. That itself is an important message and the KRG will not want to withdraw from that. The KRG is also unlikely to make promises to not to hold another referendum in the future. Second, in the KRG’s rhetoric Kirkuk appears to be a red line but they are likely compromise on this. Kurdish political parties supporting the referendum thought they could push Baghdad to start negotiations on the disputed territories. The KRG’s decision to hold the referendum in Kirkuk was considered controversial and provocative decision, but they may have reasoned that a referendum in Kirkuk might act as a de facto implementation of Article 140, the implementation of which they have been pushing for since 2005. However, holding the referendum in Kirkuk has badly backfired. Third, the KRG will want to maintain its independent oil sales. Although it is clear that KRG’s economic viability relies on its share of the federal budget, it seeks to have some degree of non-Baghdad related revenue source. It is vital for the KRG that this continues, and with Turkey and Russia’s continuing support, it will. However, due to the economic crisis, the KRG’s best bet would be to agree to some of the terms imposed by Baghdad such as overseeing oil experts and border controls. To conclude, the KRG’s bargaining position in this process is weak. It does not have the kind of international support it seeks, it is going through a serious economic crisis and internal political fragmentation and divisions have further deepened. Political plurality is a good thing in democracies but, in a situation such as this where the government must deal with a rival, stronger power, some degree of consensus among political parties would have strengthened the KRG’s position. Until today, the KRG political elite has not invested in making consensus possible and feasible on important issues and has maintained and even strengthened structural divisions along economic, administrative, military and tribal lines. The KRG budget is not subject to meaningful auditing, corruption and nepotism is common, the free press is suppressed and political accountability is weak. Things are not brighter on the Baghdad side either. The political scene in Baghdad is wrought with competition, sectarianism, corruption, nepotism and mismanagement. Moreover, the conditions that convinced the Kurds to be committed to the post-2003 settlement in Iraq have been rapidly disappearing and Iraq has not become the democratic beacon as hoped. Moreover, there are significant question marks over the way in which Baghdad has handled the post-referendum process. This is an abridged version of a paper given at a workshop on Iraq and its Regions: Baghdad–Provincial Relations After Mosul and Kirkuk, held at the LSE on 15 January 2018. See below for the full list of papers.